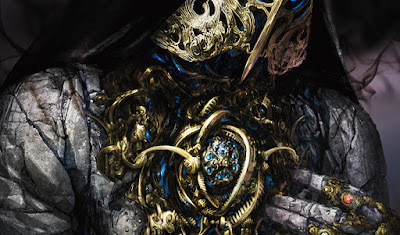 Wizards of the Coast staff are now on Christmas Holidays for the next two weeks, which means that the tech who pulled the short straw to man the station will be running a 'best of' series of articles until year's end. Should you think that this may detract from official Aether Revolt previews from being published, then you will have to reevaluate. There are another two more Aether Revolt spoilers from the last twenty-four hours to address now. 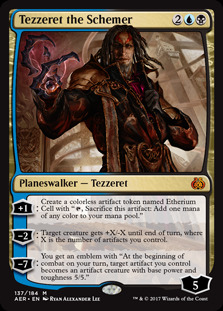 +1: Create a colorless artifact token named Etherium which has Tap, sacrifice Etherium token: 'Add one mana of any color into your mana pool'. -2: Target creature gets +X/-X until end of turn which X is the number of artifacts you control. -7: You get an emblem with "At the beginning of your combat phase, target artifact you control becomes a 5/5 artifact creature." 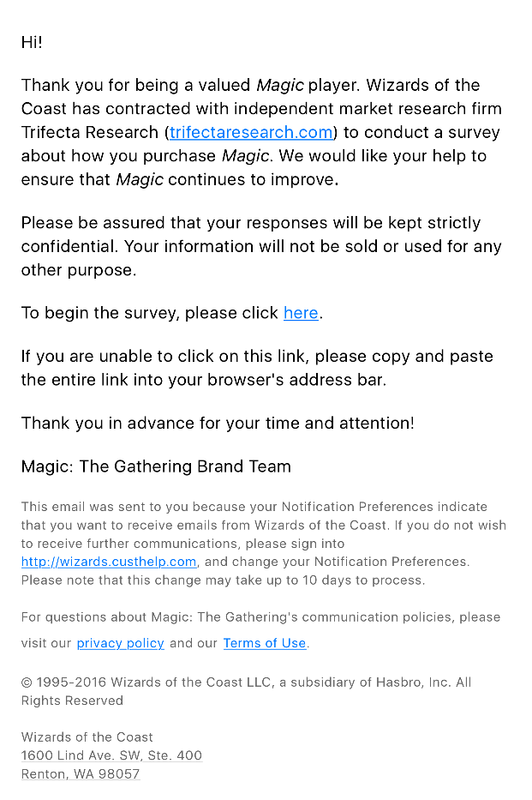 Looks like we are getting an Etherium token. Kinda salty about that, as we were hoping to get something that used or created Energy. 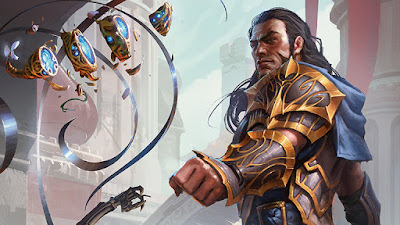 We're quite fond of the ultimate ability of creating a 5/5 beater each turn - which does NOT disappear at the end of combat. "Let's just broaden its surveillance lens." 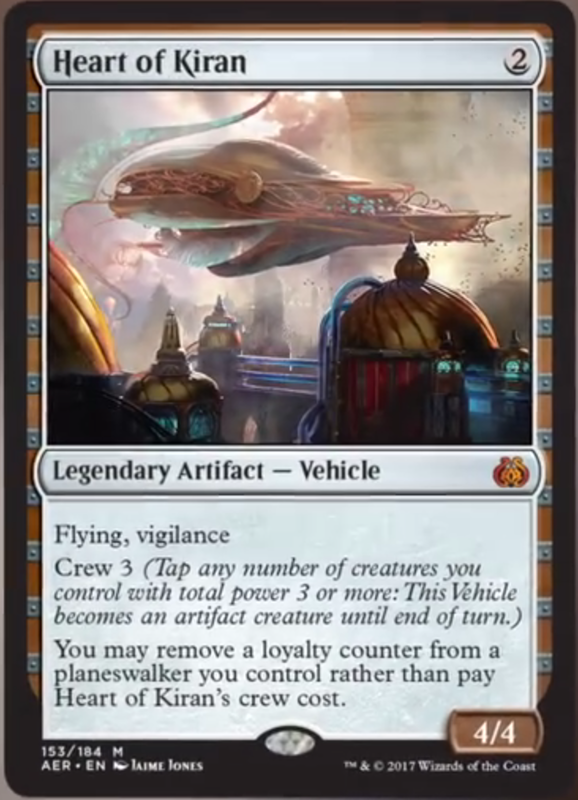 This card looks a bit narrow at the moment, but if the next standard season has a good selection of artifacts and some cards with efficient blink effects, this will shine. 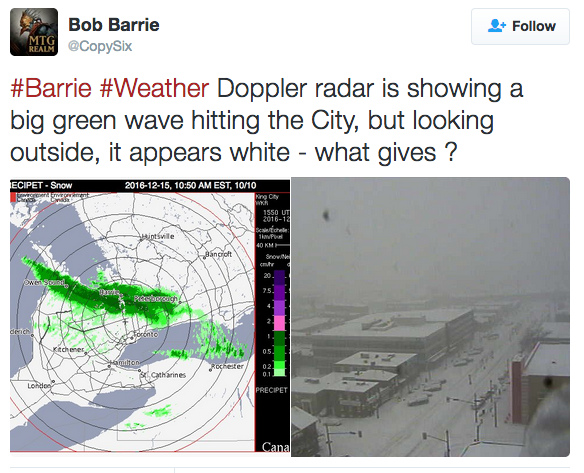 As you may see from my tweet below, it is Snowpolcalypse just now here in Barrie, Ontario. 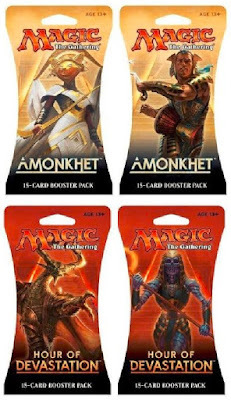 If we are getting to our local gaming store OMG! Games tomorrow for Friday Night Magic, there is going to have to be some serious snow removal in order to just get out our front door. 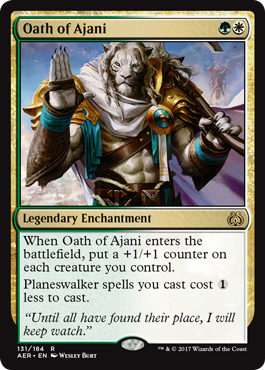 Anywhoos, enough of our frozen precipitate problems, let's get on to today's news - Another Aether Revolt card just got previewed - and - it looks like Ajani finally took the plunge and gave an Oath. 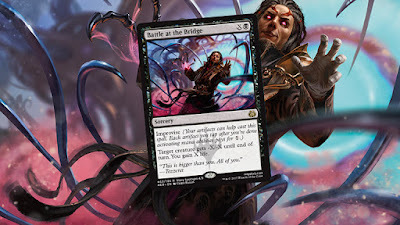 Planeswalker spells you cast cost 1 less to cast. 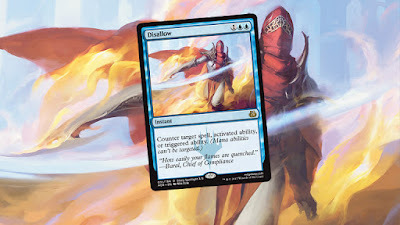 This card looks solid, and is likely our favourite Planeswalker Oath to day. 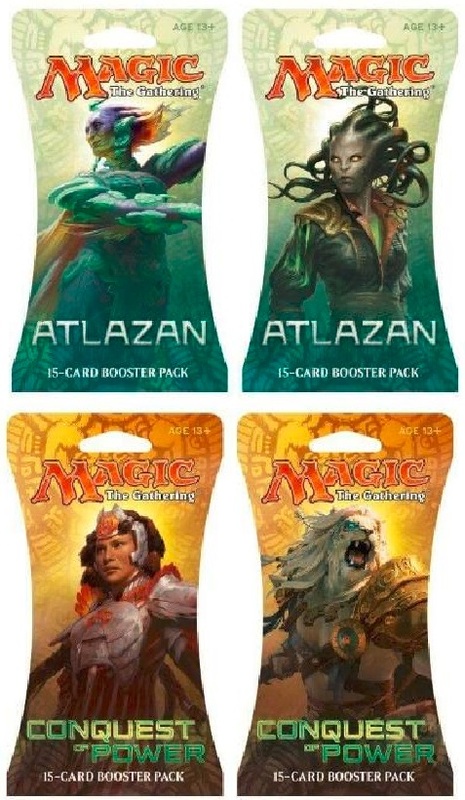 Righto - in other news, we want to talk about how some of our older sleeves and the issues we were having with double faced cards being almost visible through the sleeve back. Problem solved ! 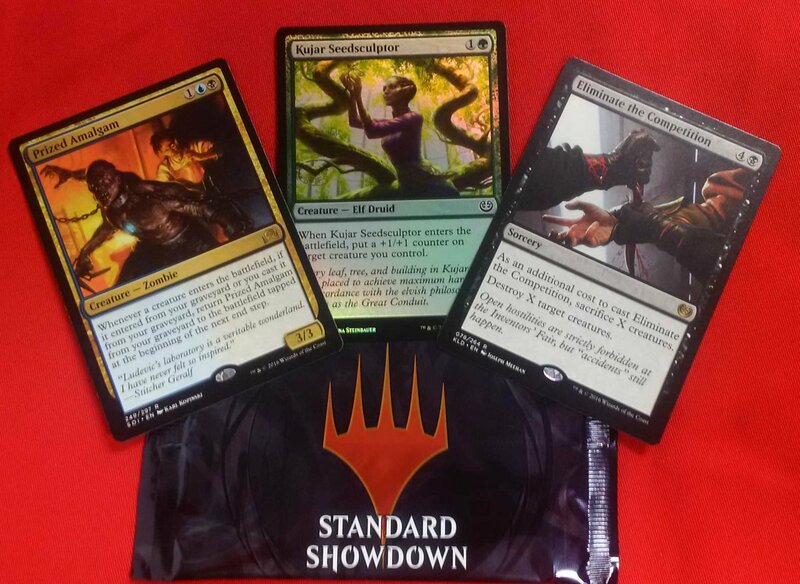 We took a test drive with Ultra PRO's new Eclipse deck protectors and are thoroughly impressed. • Completely hides card backs with an added layer of opaque black material. • Eclipse sleeves uses matte clear material to show the card face while minimizing glare. Au Vol ! 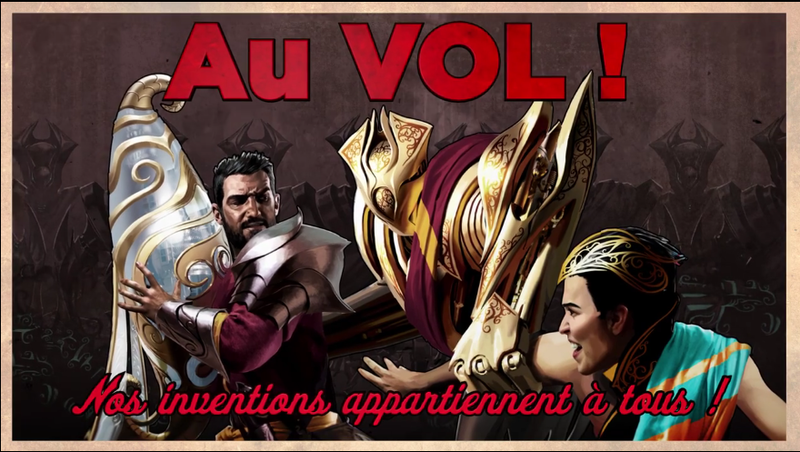 Nos inventions appartiennent à tous ! 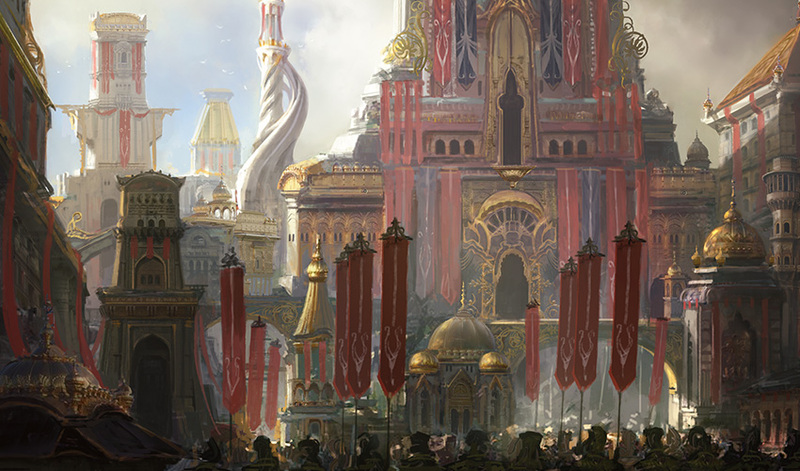 Our inventions belong to all. 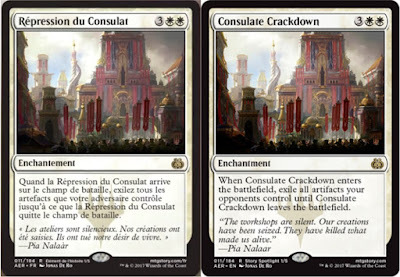 When Consulate Repression enters the battlefield, exile all artifacts your opponents control until Consulate Crackdown leaves the battlefield. "Les ateliers sont silencieux. Nos créations ont été saisies. Ils ont tué notre désir de vivre." Not that bad. 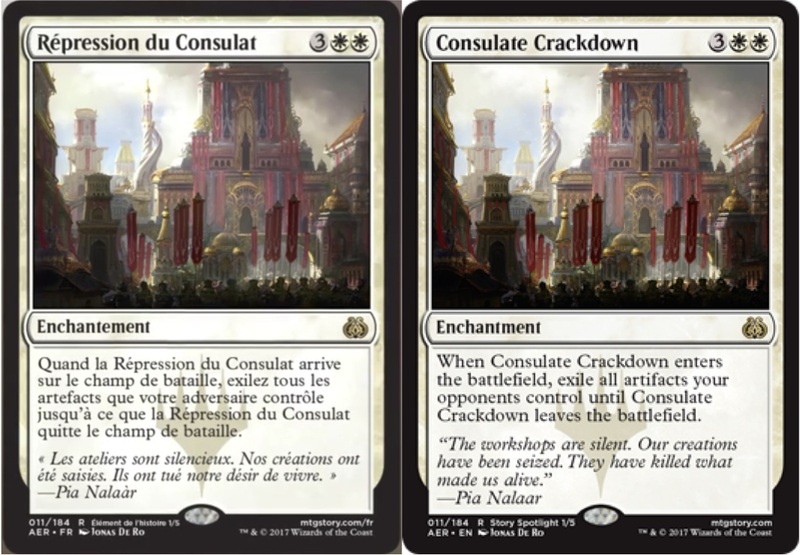 For standard, this may be relegated to a mono-white sideboard, for limited perhaps worth a shot, and for Commander, why not? Personally, we would rather just play Fracturing Gust instead. As we head into the weekend, the madness of Christmas Holiday shopping is beginning to reach a crescendo. Make certain you do not stress yourself out and take some time to relax - MTG Realm suggests getting some Magic: the Gathering games in over the weekend. 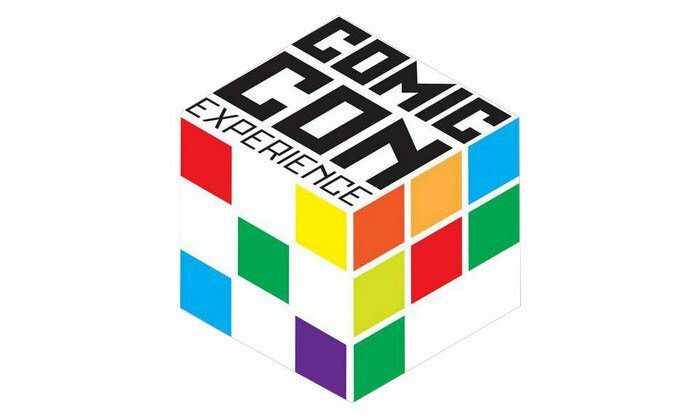 We'll be headed to our fav local gaming store, OMG! Games, here in Barrie, Ontario for Friday Night Magic. 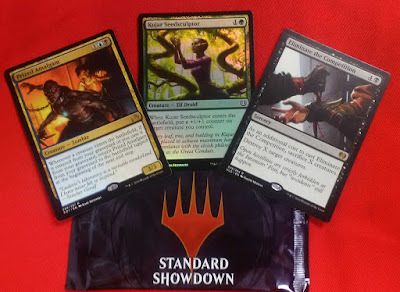 On Saturday, the Standard Showdown series continues, which so far, have been a ton of fun. 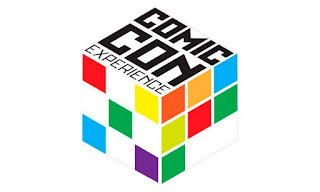 To find a gaming store near you, pop on over here. On to recent news which may be of interest. 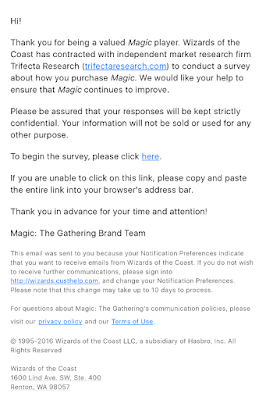 Recently, several gamers had received this eMail from the Magic: the Fathering Brand Team to participate in a survey. 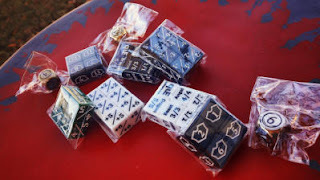 Anywhoos, after carefully reviewing these, we had to lay down on the floor and count to ten to calm ourselves down. 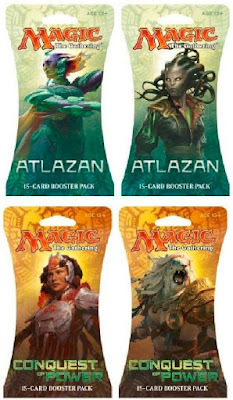 These may be product mock-up images and the next block still yet unknown, but we most definitely want this to be true. Still all very mysterious. We'll be yattering about this for a while we think. 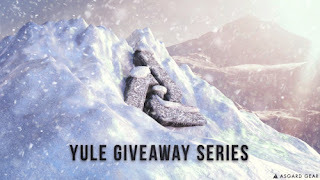 Yule Giveaway Series Part 2: You can win a rare Limited Edition 24"x28" art print features the illustration for Ghost Quarter by legendary Magic artist Peter Mohrbacher. At the time of this post, it is really, really early. 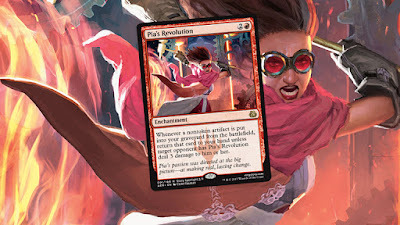 We need to catch up you with some Magic: the Gathering spoilers again - this time from some MTG Sally forum users who had taken note of a number of images already loaded up on the Wizards of the Coast Aether Revolt page (linked here) but not yet promoted to final publish. Specifically, it appears like we have four 'story' cards which may have leaked. As always, please only refer to official previews on the WotC page. 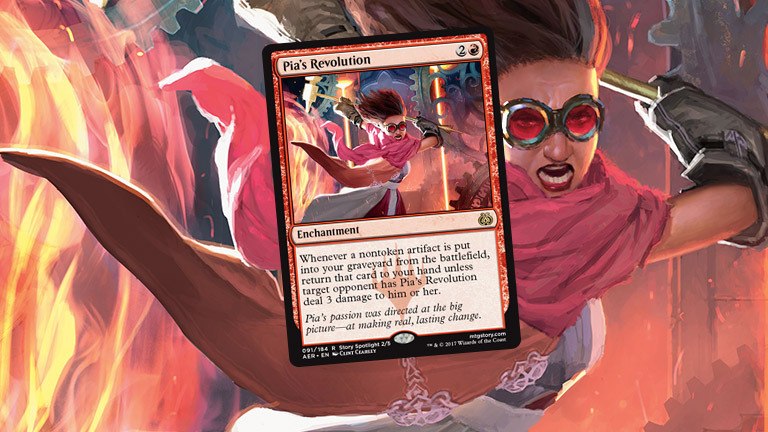 This afternoon, Wizards of the Coast previewed another Aether Revolt card in a rather unique way to provide a bit of storyline / flavour. 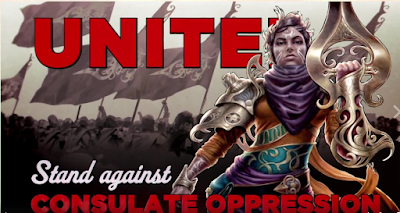 Specifically, WotC staffers Nate and Chris sat down in this video to discuss some Kaladesh cards which was interrupted by a 'rogue' Renegade broadcast which featured an 'anti-Consulate' message and a preivew cards - sweet ! 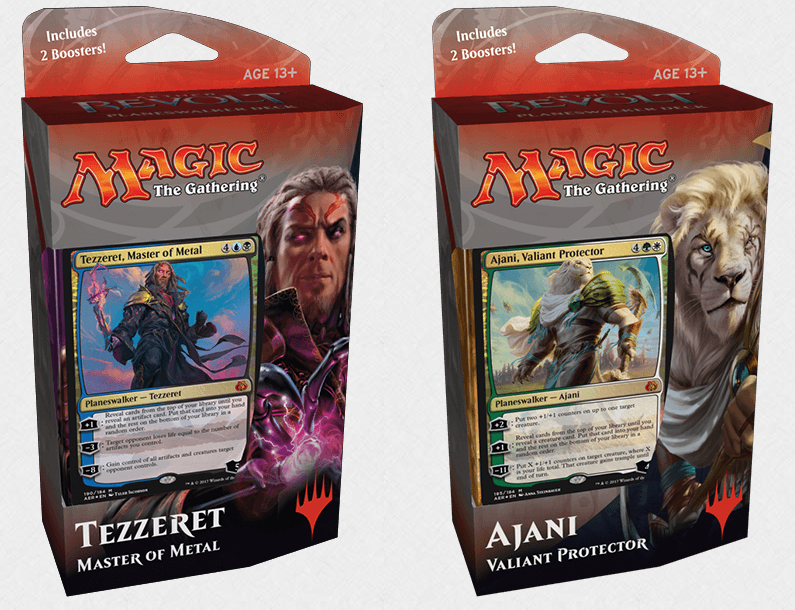 On the mothersite (linky here), WotC staffer Blake previewed Aether Revolt packaging as well as the related promo cards. 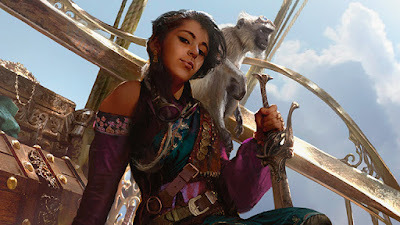 This post also include both Planeswalkers from the Planeswalker Decks. +2 : Put two +1/+1 counters on up to one target creature. 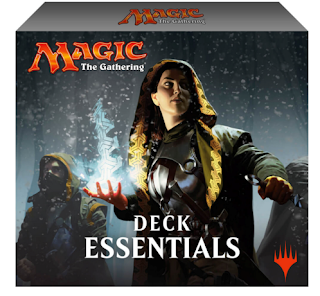 +1 : Reveal cards from the top of your library until you reveal a creature card. Put that card into your hand and the rest on the bottom of your library in a random order. 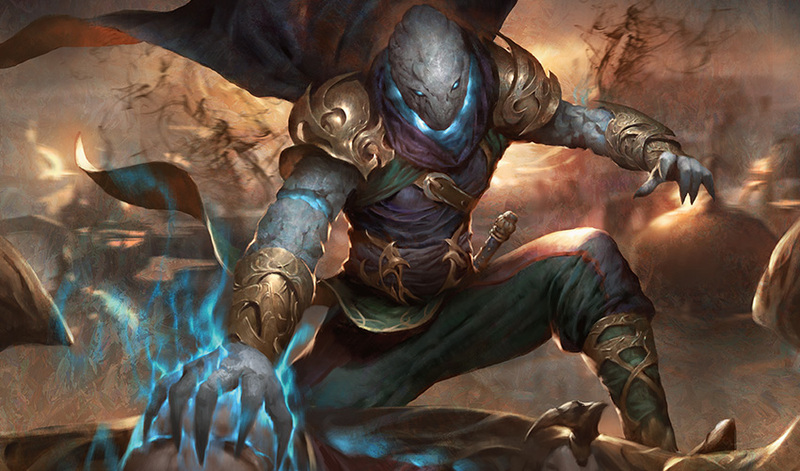 -11 : Put X +1/+1 counters on target creature, where X is your life total. 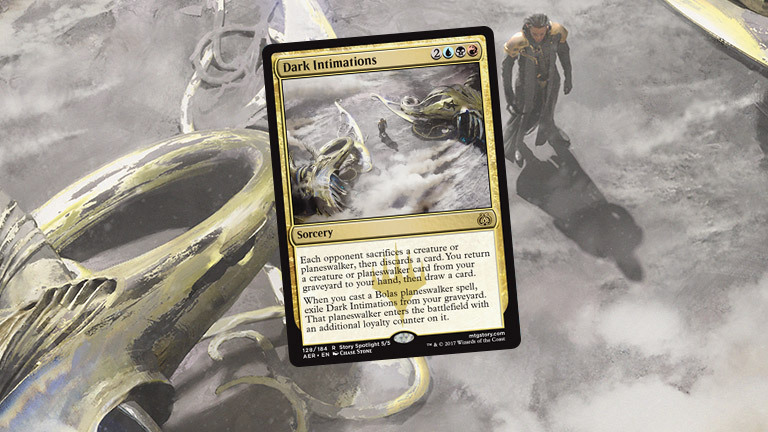 That creature gains trample until end of turn. 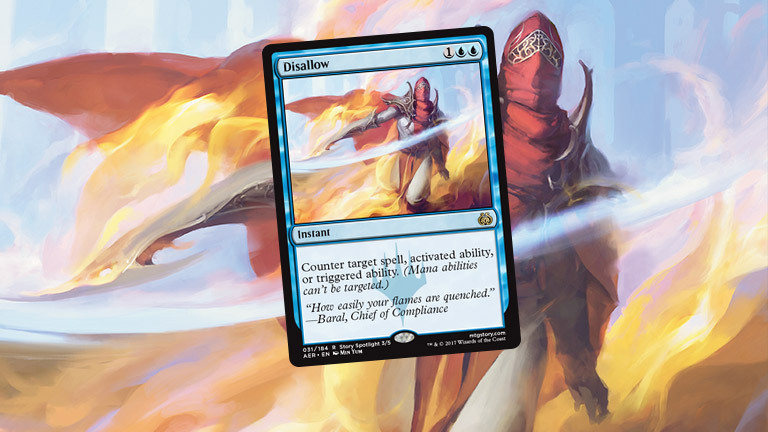 -3: Target opponent loses life equal to the number of artifacts you control. 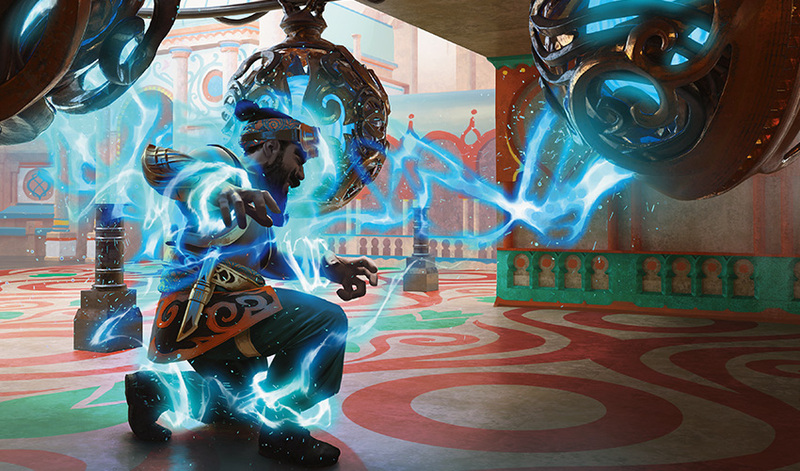 -8: Gain control of all artifacts and creatures target opponent controls. 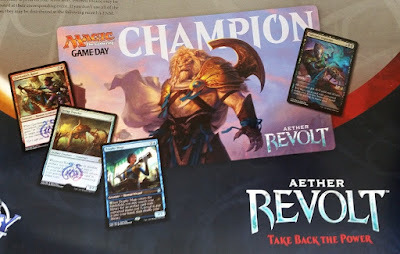 Some Magic: the Gathering history just happened a few hours ago. 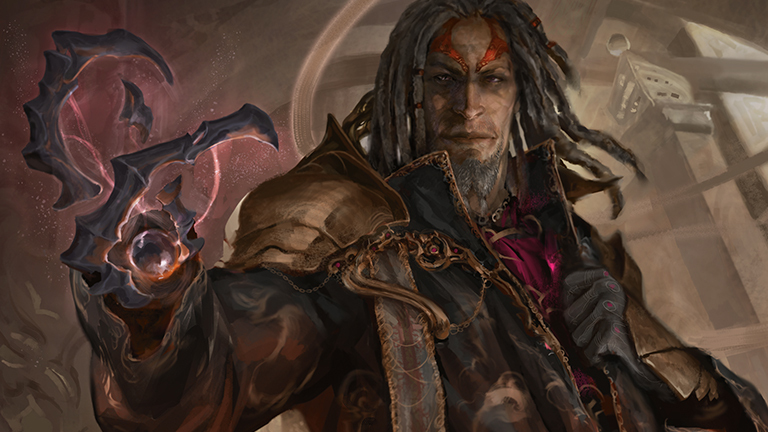 For the very first time, a major Magic: the Gathering preview was released . . . in Brasil. Abram seus olhos ! O Consulado mudou ! At the ComicCon Convention (CCXP) in São Paulo Brazil, Wizards of the Coast released an Aether Revolt Spoiler. Why in Brasil ? 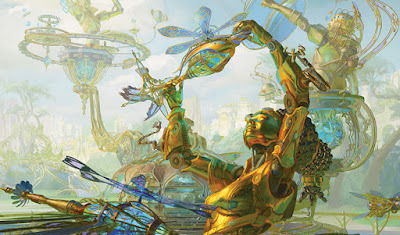 Mark indicates in an interview that the timing was perfect at CCXP with the upcoming Aether Revolt release, and that Brazil is "becoming increasingly an important part of the Magic community in the world". 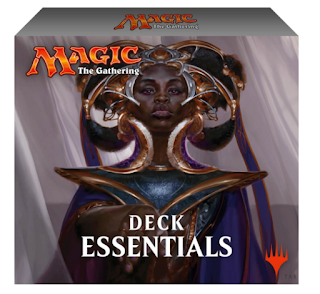 +2: Reveal the top three cards of your library. Put each nonland permanent card revealed this way into your hand and the rest on the bottom of your library in any order. 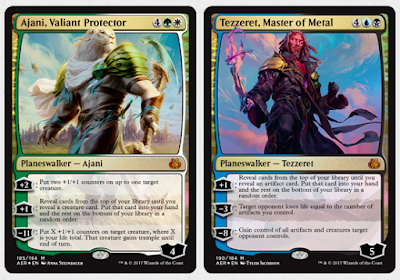 -9: Put 5 +1/+1 counters on each creature you control and 5 loyalty counters on each other planeswalker you control. Good Gravy !! 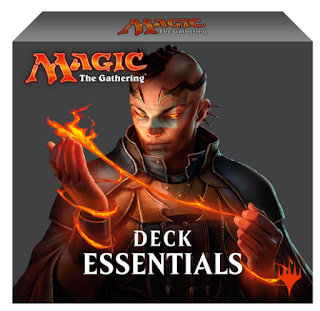 Fans of those Superfriend Planeswalker decklists must be in a tizzy over this one. Confiramo primeiro spoiler de Planeswalker da coleção Revolta do Éter de Magic: the Gathering! 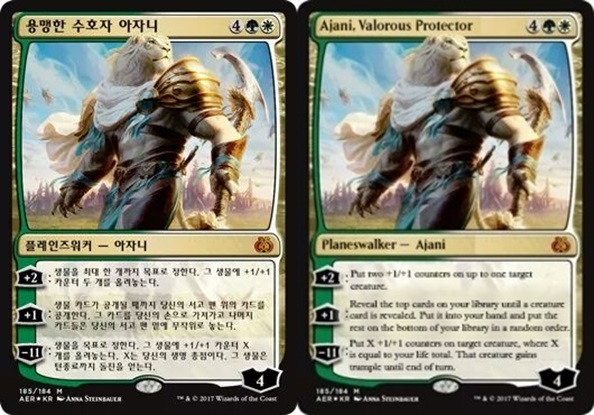 The Korean Facebook Group had posted another new Aether Revolt preview card early Monday morning (Eastern Standard Time). 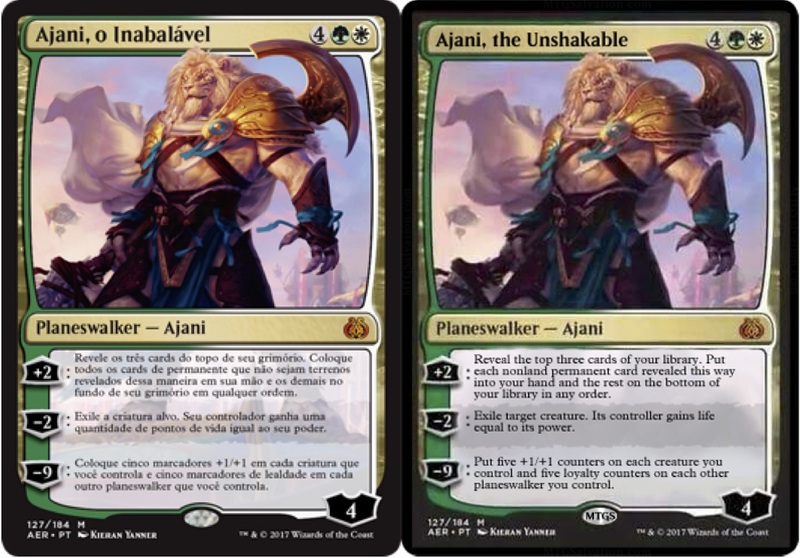 It looks to be yet another Ajani Planeswalker - this one from the new Magic: the Gathering Planeswalker Decks associated with Aether Revolt. 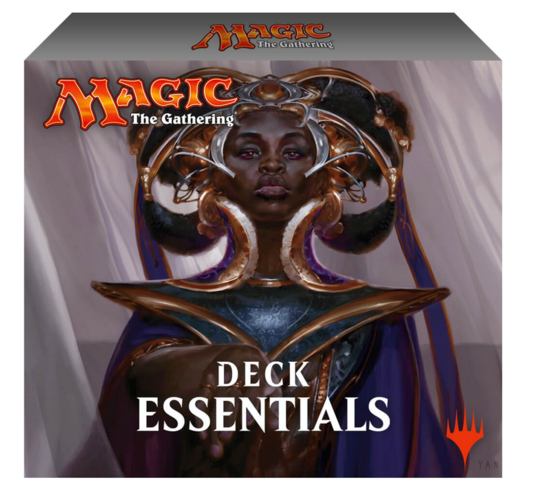 +1 : Reveal the top card of your library until a creature card is revealed. Put it into your hand and put all other cards revealed this way onto the bottom of your library in a random order. 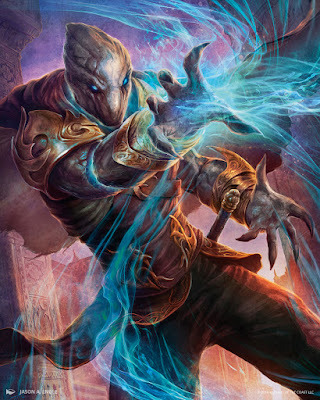 -11 : Put X +1/+1 counters on target creature, where X is equal to your life total. 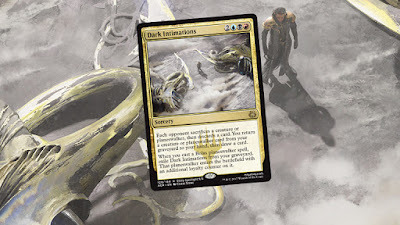 That creature gains trample until end of turn.